For many guinea pig owners, it can be hard to figure it which toys your guinea pig will love you for. So, in today’s article, we’ll explore the top 7 toys that will make your guinea pig jump for joy and also cover what to avoid! If you’re in a hurry our top 7 picks are right below, and below that, we’ll dive into a bit more detail. In the wild, guinea pigs are not ones to burrow tunnels but they love to seek shelter in burrows of other animals as well as in tunnels formed by vegetation. 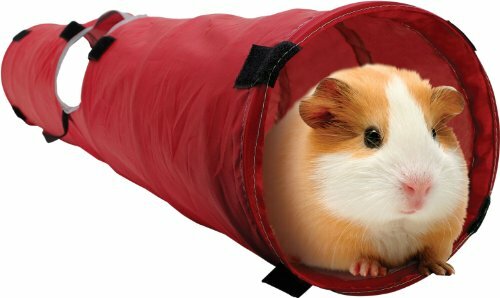 As we want to mimic the natural behavior of our pets when captive, it is a very good idea to get tunnels, which your guinea pigs will love exploring. There are quite a few options out there, but by far, our two favorite options are shown below. In general, guinea pigs are very social animals that love to spend time together with each other and their human owners. However, like the rest of us, guinea pigs also need their private space from time to time. For that, guinea pig houses are great as they’ll provide your pig with some well-earned quiet time. You should get at least one guinea pig house per guinea pig. Material: You can get many kinds of guinea pig houses. Some prefer soft material will others will prefer to sleep on the floor in a simple wooden or plastic structure. Structure: You’ll need something with a solid top, and solid wall with one or two openings on the side. Hay and bedding? 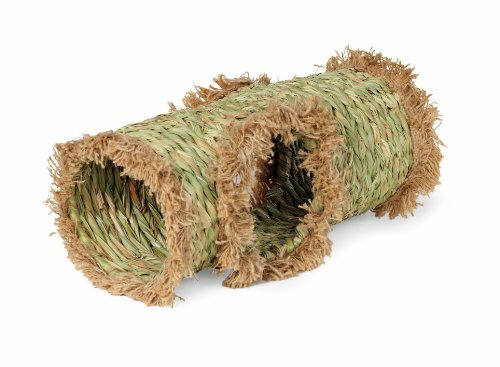 There’s no need to put hay and bedding into the house – the guinea pig will take care of that if it needs it. Below you can see our top three picks when it comes to guinea pig houses. Guinea pigs are rodents and as such, they have ever-growing teeth. As they are not that good at handling a toothbrush, they constantly need something to chew on to keep their teeth short. Having some good guinea pig hay goes a long way, as they’ll spend a lot of time chewing this, but for variety, a guinea pig also enjoys some treats. In general, try to feed them greens rather than fruits, which are high in sugar. Besides the things you have around the house, a lot of guinea pigs enjoy treats that are specially made for them. Below we have collected our top 3 picks for guinea pig treats. These are all safe to feed and will keep your guinea pig occupied for some time. In addition to treats which your guinea pig will digest, it is a good idea to have some chew toys around the house. While these are often good and solid options, there is always the risk materials not labeled as pet-friendly can contain residual chemicals that are not good for your guinea pigs. 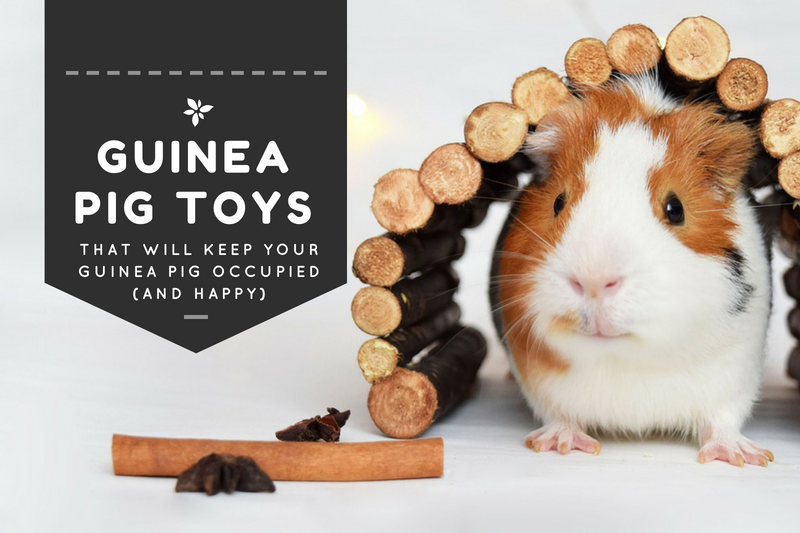 And that’s why we recommend getting guinea pig toys produced for pets (unless you are sure about your household items not containing anything that can be unhealthy for your guinea pig). … and it gets even better if it’s a ball they can chew as well. 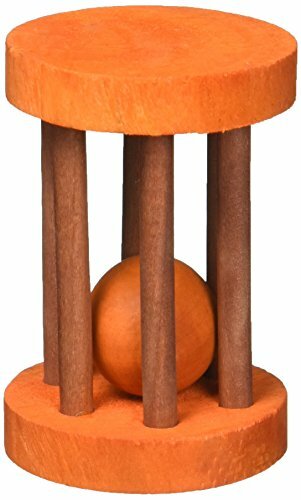 The ball below is thus perfect as it will both peek the curiosity of your pig as well as providing something to gnaw. All handmade, 100% natural materials, no glue, plastic or metal. 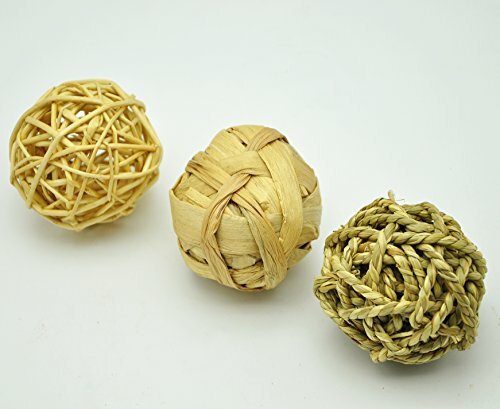 Great for playing and nibbling, help prevent boredom. We haven't included it here but to have the maximum well-being for your guinea pig, you also need some gool ol' guinea pig grooming. And if you're looking for a good hay rack / feeder, then look no further.